Peterson have a deserved reputation for making very high accuracy strobe tuners – essential for studio and live musicians. Nowadays they are all fully digital and come in various sizes from desk top, through floor pedal to clip on. 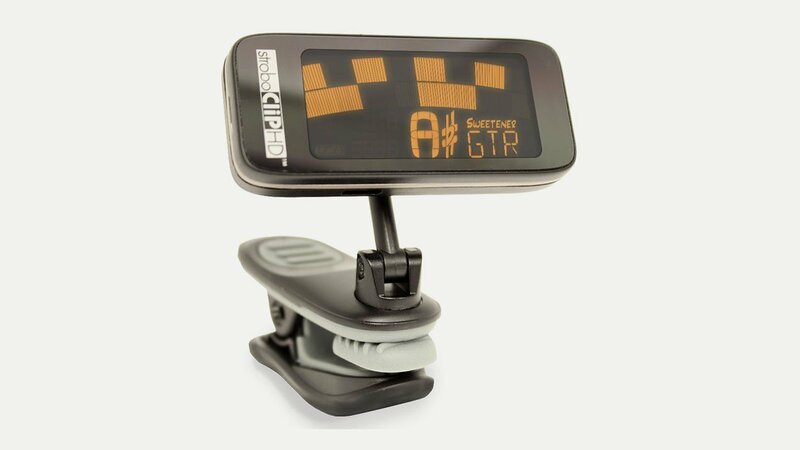 A ‘normal’ clip on tuner will cost £5-10 but the the Peterson StroboClip HD retails at £49.99, which is a bit of a leap! It has the same tenth-of-a-cent accuracy as all Peterson Strobe Tuners, comes complete with a bright high-definition screen, over 50 Sweetened™ tunings, alternate temperaments for a vast array of string and wind instruments, and soft rubber-lined jaws to protect your instrument’s finish while offering a firm grip for maximum signal tracking. The sweetened tunings allow you to zone in on electric, acoustic, bass, baritone etc giving enhanced tunings for superior sound.